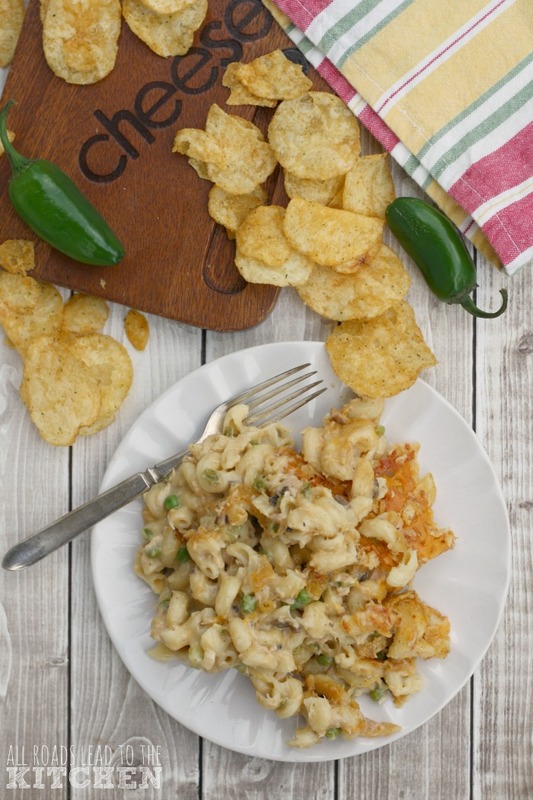 I consider tuna noodle casserole to be classic Americana comfort food (why yes, I did grow up in the Midwest), but Chrissy's version is kicked up a notch by the addition of jalapeños in the casserole itself, and crunchy jalapeño potatoes chips baked with the cheese on top. She unapologetically calls for "cans, cans, cans" (because that's the way she likes it). Now, I have no problem with using canned condensed cream of mushroom soup to make this (and lots of other retro recipes), mostly because I use Campbell's Healthy Choice variety, and it doesn't contain MSG. But you could definitely use the equivalent of a homemade condensed cream of mushroom soup if you'd rather (try this version from Simply Scratch, this version from The Pioneer Woman, or this version from Gimme Some Oven). Whichever way to choose to make it (and you should definitely choose to make it) is worth it. 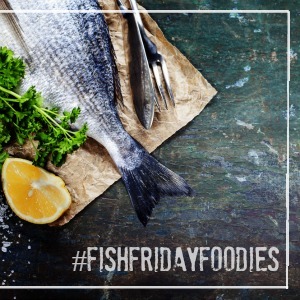 This month's theme, Fish in a Dish, is hosted by Sue at Palatable Pastime. Check out all of the delicious offerings below the recipe! 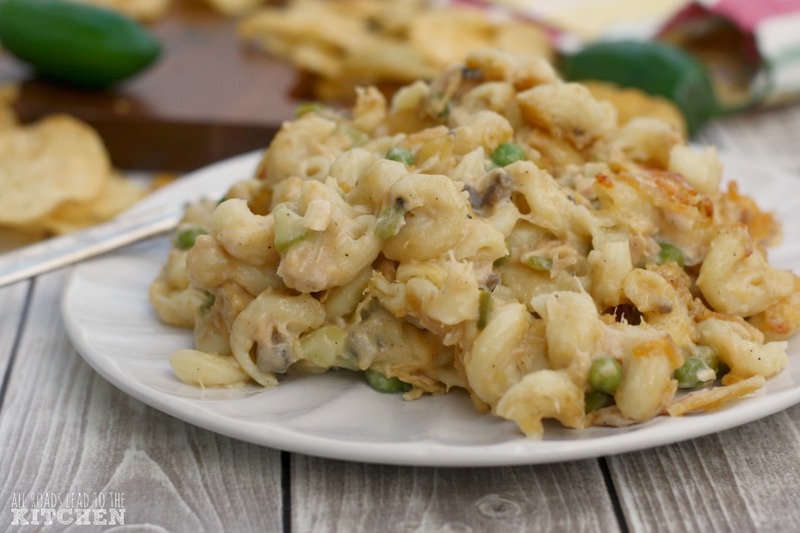 Tuna casserole noodle casserole with a jalapeño kick (plus plenty of cheese and a nice, crunchy topping that's made with jalapeño kettle chips)! Preheat oven to 350° F. Spray a deep 9 x 13-inch baking dish with cooking spray or grease it with butter. Bring a large pot of salted water to a boil and cook the pasta for 2 minutes less than the instructions on the package tell you to, then drain. Combine the drained pasta and all of the remaining ingredients for the casserole in a very large bowl and stir well to combine. Pour into prepared baking dish. Add the cheese to the baggie and toss to combine. Scatter the mixture over the casserole. 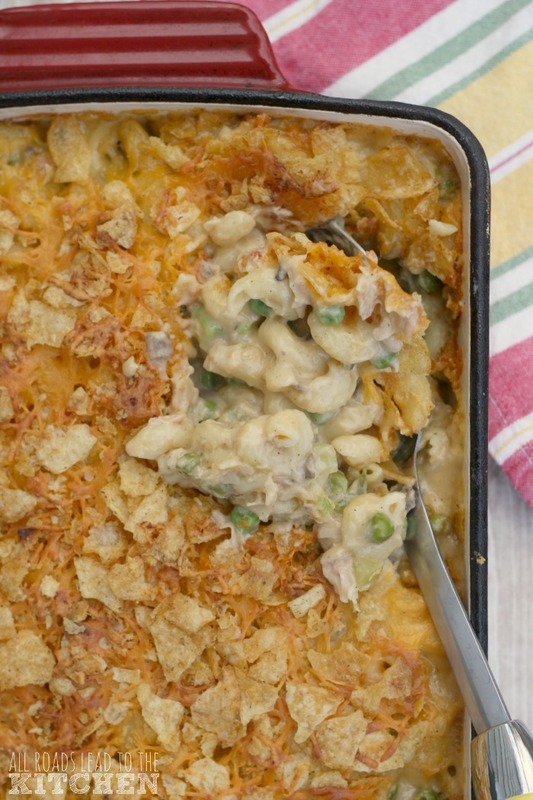 Slide into preheated oven and bake until the top is golden and the casserole is bubbling, 50-55 minutes. ©All Roads Lead to the Kitchen. Lightly adapted from Cravings by Chrissy Teigen.